Next stop: Britain. 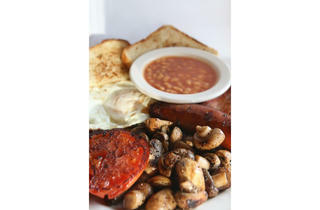 Looking for a proper English breakfast? Head to this Westside pub for the best brunch in LA for everything from crumpets to blood pudding. The Promenade may be an unlikely place to find a proper English breakfast, but Ye Old King's Head—there’s the restaurant, pub, bakery and gift shop that sells all things British—has been around for almost 40 years. Stop in mornings to what feels like a homey countryside inn where the telly’s always on (likely to a football match) and waitresses with thick accents dish up unfussy breakfast plates—no substitutions allowed. 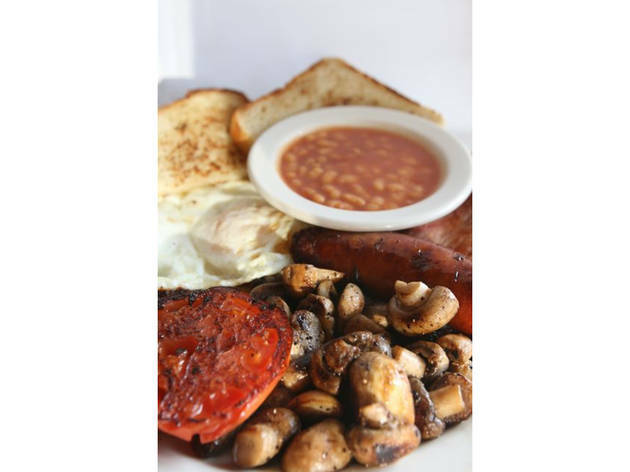 Come hungry for a Queen Size ($11.95) that’s packed with fried bread (griddled bread to us Yanks) or toast, two sunny-side up eggs, two strips of bacon, one banger (sausage), English baked beans—straight outta the can from England—and grilled tomatoes. "Vegetables" round out the meal for an upgraded King Size ($12.95) which includes sautéed mushrooms. Vegetarians can find solace with a pork-less plate that includes two soy patties ($11.95). Anglophiles and homesick Brits can also find Britain's national cereal Weetabix ($6. 95) served with fruit; crumpets ($2.95) served with imported English jam and marmalade; and even black pudding ($3.95), which is in fact not a pudding but a savory (and in this case cake-like) mold of oatmeal, bread, herbs, spices and, yes, blood. Breakfast served until 3pm daily. 116 Santa Monica Blvd, Santa Monica; 310-451-1402; www.yeoldekingshead.com.